With the Terracotta Far East Film Festival a week away, I thought it would be good to mention the reasons on why you should attend! They’ve got everything from 20th Century Boys to Cow! I invite you to read the full post and enlighten yourself to the 5 Reasons why you should go to Terracotta Film Fest! Not only do they have the documentary “Development Hell” (showing Friday 7th May) which focusses on Teddy Chens ten year struggle in making the movie “Bodyguards and Assassins” (showing Sunday 9th May), they are also showing Bodyguards and Assassins, followed up by a Question and Answer with the man himself Teddy “Purple Storm” Chen! Hopefully it wont look this frightening. But! The Japanese Party night should be rocking! They’ve got Third Window Films – Adam Torel on the decks and Japanese bands; Peter Parker Rocks and Sunset Drive! Co-Play dress up is expected, but I wont have room for my Taoist Priest gear, only room for one’ one eyebrow if you know what I mean! Yves Montmayeur delivers a documentary double bill of “In the mood for Doyle” and “Yakuza Eiga“, the latter which will be a great insit to future Japan on Fire episodes where we will cover Yakuza movies. Another fine edition to this double is that Yves Montmayeur will be there in person to do a Question and Answer after the Doc’s! Have you seen their Line Up?! They’ve got Jackie Chans 99th Film; Big Little Soldier, Jackie is teamed up with the Avenging Fist “Alexander Wong”! We’ve got our fill of Hong Kong Thrillers with Johnnie To’s “Vengeance” Johnny Halliday and the regular To crew! 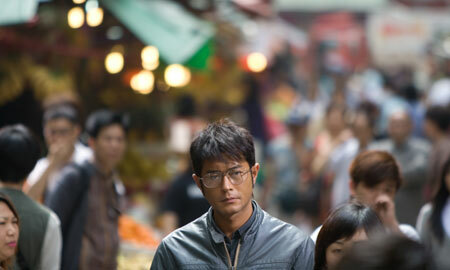 Soi Cheangs “Accident” will also be showing, which stars Louis Koo! Japanese Cinema buffs will get their fill as well with K-20: Legend of the Mask, Summer Wars, Fish Story and the final instalment of the 20th Century Boys with 20th Century Boys 3! We’re also given Korean Comedies and Thai Horror! Difference? I shaved in one of them. Yes the least interesting member of the team is going. I’ll be going most of these movies, so if you see me, please introduce yourself! and buy me beer!